First of all, apologies for my lapse in Blog/Song of the Week momentum of late; the demonstrations outside my apartment building have been intense, as I’m sure you can imagine. But you guys, I’m doing stuff! By now, most of my devoted handful of readers are aware that I’ve been working on a new show called You’re Gonna Hate This, which Lindsay Mendez and I will be doing at Joe’s Pub in like FIVE MINUTES!!!!! Okay, actually, it’s in a little less than two weeks, but it feels like five minutes. In the good way. I finished writing it about a week ago – been going pretty much non-stop since November – and finished orchestrating it yesterday. So now I just need to learn all those lyrics I made up and figure out what to do with my hands. (Sometimes they’re playing instruments, but not always, and I’m told that nail-biting is not an option during the quiet parts.) Tickets are going fast, but we’re not sold out yet! – and let’s face it, we have a six-person band to pay: it’s an extravaganza, chickens. So if we don’t sell out, I’ll be homeless in three months, as opposed to the four I was counting on. Or just come for the music. You’re Gonna Hate These People (L-R): Shoshana Feinstein, producer; MH (I don’t know what’s up with the Claudette Colbert leg action); Michael Borth, musical director; Lindsay Mendez, whatever; Dave Solomon, director. Today we ventured over to the club so we could check out the room and figure out some showbiz-type stuff (piano/mic placement, holding area for the camels; y’know, the usual), and one of the nice people there took our picture, complete tourists that we are. But we do have a mighty photogenic team, and I am all about the sharing. 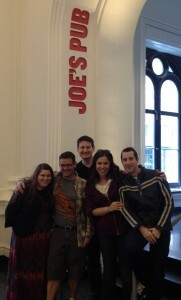 And we are all very excited to show you what we’ve been up to, so come to Joe’s Pub on April 21! You don’t want to be one of those people 40 years from now, lying about having been there when you weren’t, because Lindsay will still be alive, and she’ll remember. This entry was posted in Appearances, Blog, Music, Musicals, News and tagged joe's pub, lindsay mendez, michael holland, NYC, shows, you're gonna hate this. Bookmark the permalink.